Organised events that bring many people together can often be a valuable opportunity for awareness-raising, learning and creating a new culture of caring for natural, social and financial resources. But these same events pose significant problems for local natural resources, (e.g. energy, water), environment (e.g. caused by emissions, waste, soil degradation) and the community. A green event is one designed, organised and implemented in a way that minimises negative environmental impacts and leaves a positive legacy for the host community. 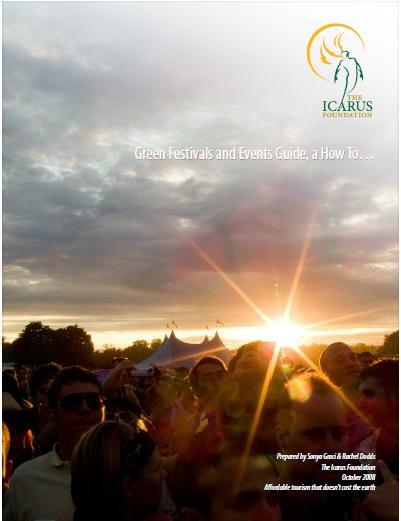 This Canadian guide is produced by the Icarus Foundation and walks event organizers step-by-step through the various considerations in organizing an event and makes relevant suggestions. While it is oriented to festivals, this guide is useful for oganizing any sort of environmentally friendly event. This website provides a modest library of Canadian resources for organizing a green meeting. It is produced by an environmental consulting company in Toronto. To assist organisers and hosts of small-to medium-sized meetings in greening their events, ICLEI, in cooperation with UNEP, has developed the Green Meeting Guide 2009!